On April 3rd we were asked to assist with the "Every 15 Minutes program at Ganesha High School. Please see below to learn more about this program. 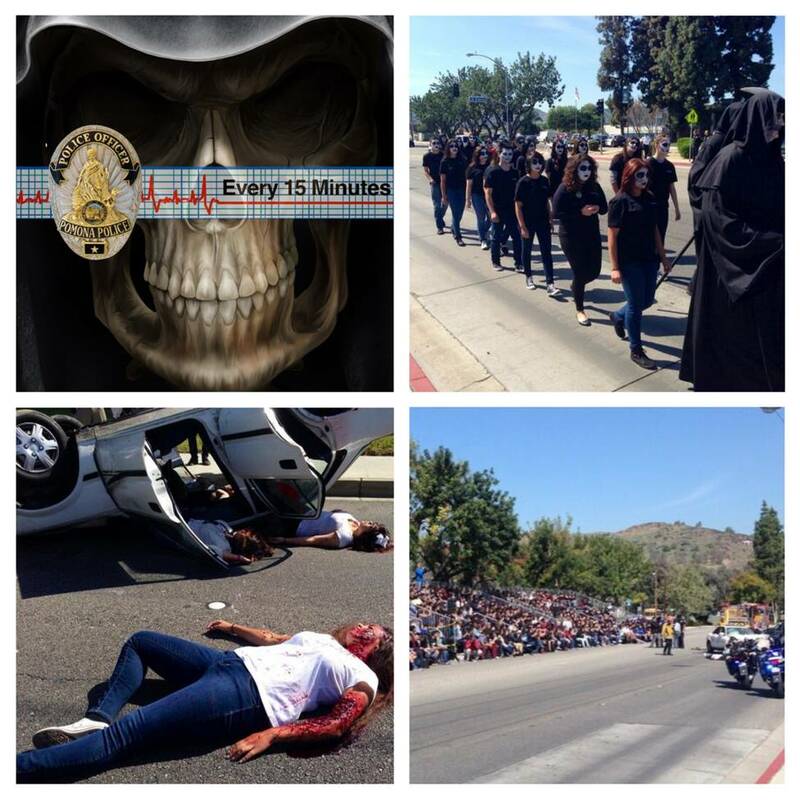 On April 3rd and 4th, the Pomona Police Department presented the "Every 15 Minutes" program at Ganesha High School. The two-day event is designed to demonstrate the consequence for teenagers exerting poor judgment related to drinking alcohol and driving. This event is also a reminder that every 15 minutes in America someone loses their life in an alcohol-related traffic collision. The program focuses on educating high school Juniors and Seniors. It challenges them to think about driving under the influence, distracted driving, personal safety awareness and their responsibility to make mature decisions when lives are at stake. The first day of the program includes the "Grim Reaper" entering a classroom every 15 minutes and removing a student. A police officer will read that student's obituary to fellow classmates. The student is then a "living dead" reminder to the students left behind. The first day also includes a mock, fatal traffic collision (please see below) in front of the Ganesha High School and students portray the involved parties. There is an overnight retreat for the participating students. The retreat includes education, reflection and team building exercises. Day two of the program consists of an assembly including a mock funeral procession video footage of the two-day event, guest speakers and the involved students returning to "life". This program is funded by a grant from the California Highway Patrol as well as a Driver's Safety grant from State Farm Insurance. We thank PUSD, CHP, LA County Fire, Cole Schaffer Ambulance, State Farm Insurance and all of our other community partners that are supporting this event. Please see below the slide presentation of this event! We want to thank Sheri Orellana for taken these photos. Posted on April 15, 2014 by Bob & Jane Keller and filed under Blog Updates and tagged every 15 minutes event Pomona Police Department.